You’re not the only one that needs to bundle up this winter– your cell phone does too! As temperatures drop into the bitter cold, Wireless World wants you to remember that excessive time outdoors can negatively impact the performance of your smartphone or tablet. Continue reading to understand why cold weather impacts your phone and how you can protect your device during the winter months. According to Apple, iPhones and iPads should be kept in temperatures ranging from 32ºF to 95ºF. Outside of that operating temperature range, your device may experience shortened battery life, touchscreen issues, and trouble charging. In extreme cases, the device may even shut down altogether. If your device is experiencing the aforementioned issues during winter months, rest assured there is a scientific explanation for its behavior. A majority of modern smartphones operate using lithium-ion batteries, which are far more sensitive than alkaline batteries. When lithium-ion batteries are exposed to frigid temperatures, chemical reactions within the battery slow down or stop completely. As a result, the battery discharges significantly less current than the device needs to continue operating. The phone mistakes the slowdown in current for your device running out of juice, and therefore, it begins slowing down performance, shortening your battery life, and ultimately shutting down your device. Fortunately, the issues caused by cold weather are only temporary. Once the lithium-ion battery warms up and reaches its recommended operating temperature, the device’s performance resumes as normal and an iPhone repair is not needed in most cases. Although the effects of cold weather on your device are only temporary, the team at Wireless World prefers to keep devices working optimally at all times. 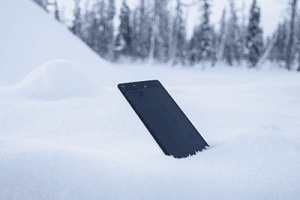 Use these tips to keep your phone operating in tip-top shape all winter long. Keep the cell phone in your bag or purse to shield it from inclement conditions. Use an insulated, thermal protection phone case. For more information on how cold weather impacts your phone and for tips to protect your device, contact us for iPhone repair. Our technicians are well-versed in troubleshooting and can help you determine whether your device is suffering as a result of the weather or if something else is causing your device to malfunction.